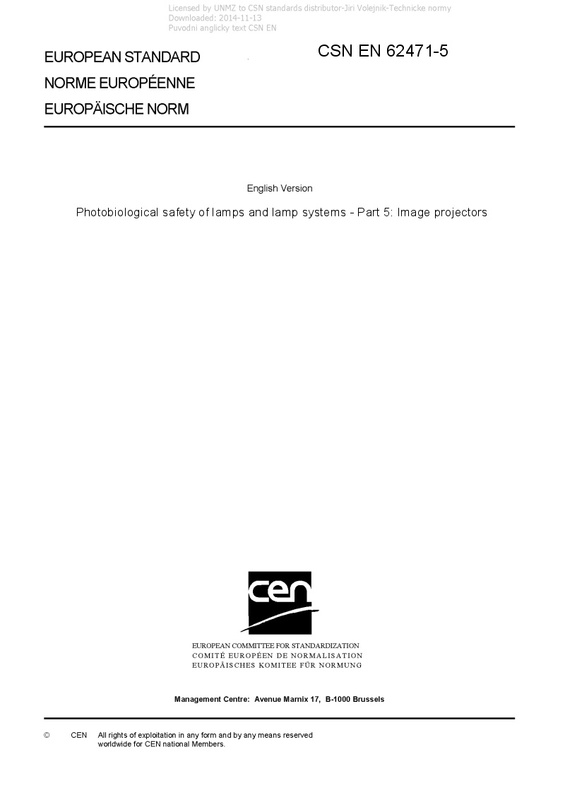 EN 62471-5 Photobiological safety of lamps and lamp systems - Part 5: Image projectors - IEC 62471-5:2015(E) provides a risk group classification system for image projectors, and measurement conditions for optical radiation emitted by image projectors. It includes manufacturing requirements that may be required as a result of an image projector system being assigned to a particular risk group. Therefore, this part of IEC 62471 provides safety requirements for lamp systems that are intended to produce projected visible optical radiation, such as theatre projectors, data projectors and home-use projectors. The assigned risk group of a projector product also may be used by projector manufacturers to assist with any risk assessments, e.g. for occupational exposure in workplaces. National requirements may exist for the assessment of products or occupational exposure.